Think you can’t afford to have a good social media management system? Think again. Budget should never be a deterrent in monitoring the chatter around your brand. Listening to online buzz should be part of everyone’s day whether you are an enterprise level operation or a one-man shop. Even though the market is saturated with low cost and high cost listening tools, you can put together a pretty good basic listening dashboard with no-cost tools. Most of all, your listening dashboard should have the power to double as a social media management system (SMMS) that allows you to do elementary functions such as post, comment, and schedule posts. This allows you to manage and monitor from the same dashboard. Here are my favorite free tools. A mix of these will work for your basic needs, depending on what you want to monitor. Hootsuite is the best place to start. With the free version of HootSuite, you have the ability to manage a total of five accounts from Twitter, Facebook, LinkedIn, Foursquare, Ping, WordPress, MySpace, or Google Pages. You are allowed one admin to control those accounts. But when it comes to monitoring, you have the ability to stream search terms, hashtag feeds, and Twitter lists as well. You can monitor up to ten streams per tab and have 20 tabs on your free account. Note: there is no good search engine for Facebook. The only thing you can really do effectively is monitor the pages you manage. 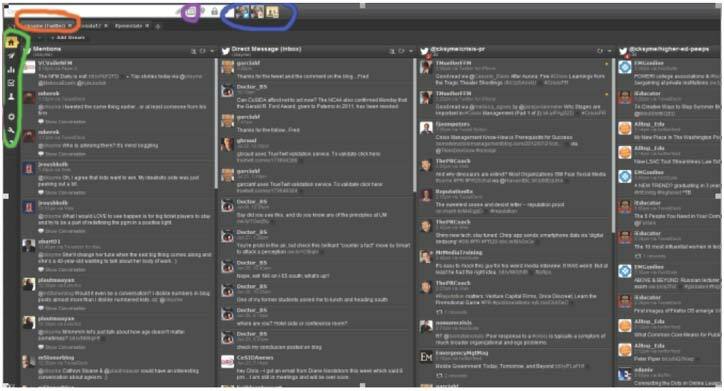 In the screen shot above is a Hootsuite dashboard, the tabs I have are along the orange highlighted line. One tab for all Twitter lists and other tabs for specific search terms. As you can see in the blue, there is only three managed accounts in this example of Hootsuite. The little icon highlighted in purple is the calendar function that lets you schedule posts to all your social networks. The green highlighted panel is where all the reports and settings reside. I have a number of Google Alerts set up to be delivered to my email daily. Occasionally I set some up to be delivered in real-time. This tool covers the web well, but not social media. Social Mention is good for real-time searches. Depending on how strong and precise your search term is, you will get good results. You can see from the da shboard above that there are two ways to search: on social platforms or on the web platforms on the “All” pull-down menu on top. I recommend trying it out and seeing if it works well for you. I recommend setting up a newsfeed that you can peruse on a daily basis. I would include competitors’ blogs, sector blogs, internal blogs, news feeds, and any other online information you want to keep track of. I use Google Reader so I can track it from any other Google platform I have open. I glance at titles and read anything I feel I need to. There are a number of news aggregators out there including Netvibes, NewsGator, Feed Demon and others. Find one you like. Discover early warning signs of negative or false information that can trigger a crisis, if left unattended. Identify your key critics and watchdogs; key influencers and advocates. Identify which social media channels best suit your organizational culture, and which ones your stakeholders frequent. Follow your competitors and discover what is engaging and trending in your sector. Uncover ethical blind spots your organization may have. This is just a short list of free tools you can piece together for a good monitoring system. Do you have a preferred monitoring system set up? Tell us how does it work for youi?